As might be expected from this fiercely provocative writer, David Mamet’s interest in anti-Semitism is not limited to the modern face of an ancient hatred but encompasses as well the ways in which many Jews have themselves internalized that hatred. 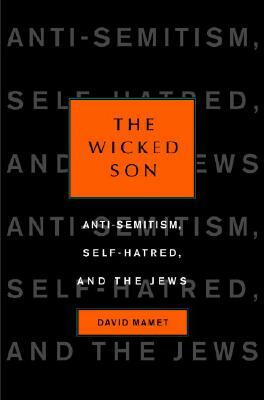 Using the metaphor of the Wicked Son at the Passover seder—the child who asks, “What does this story mean to you?”—Mamet confronts what he sees as an insidious predilection among some Jews to seek truth and meaning anywhere—in other religions, in political movements, in mindless entertainment—but in Judaism itself. At the same time, he explores the ways in which the Jewish tradition has long been and still remains the Wicked Son in the eyes of the world. Written with the searing honesty and verbal brilliance that is the hallmark of Mamet’s work, The Wicked Son is a scathing look at one of the most destructive and tenacious forces in contemporary life, a powerfully thought-provoking and important book. David Mamet is a Pulitzer Prize--winning playwright. He is the author of "Glengarry Glen Ross," "The Cryptogram," and "Boston Marriage," among other plays. He has also published three novels and many screenplays, children's books, and essay collections. "A bold and blistering attack on all aspects of this enduring phenomenon, and a probing analysis of its root causes and some of its more insidious manifestations."